My first baby! Poor Maxwell gets no face time anymore so I thought I'd give him a shout out...we still love you even though you shed like a Yetti!! I have good news and bad news....good news first. We have the most fabulous babysitter ever known to man. Payton lives just down the street from us and has been keeping the girls for a few weeks now and we all just love her to death! Bad news is she is about to leave to go to school at Alabama at the end of the summer...Poo!!! The girls go nuts when she comes over yelling and screaming and jumping around the minute she rings the doorbell. The pictures up top are of S&T with their piggy banks that Payton brought to them today for their birthday. So sweet of her to do that! I get this face from Taylor a lot lately! Just to give you an idea of how many pictures I have to take to get just one good one....this is how every photo session is with these two. 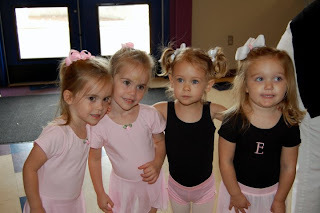 The girls had their first dance class last Tuesday and they had a great time. Their friends from our playgroup, Emerson and Avery, are both in the same class so that makes it extra fun. They all seemed to really enjoy it. The pictures I took didn't turn out so well because I couldn't remember how to take the flash off of my camera and I was taking these pics through a 2-way mirror. Maybe I can get some better ones tomorrow.